Vandals using dogs have destroyed 50 nests at a colony of endangered sea birds, according to conservationists. Wardens said only 29 nests remained at the coastal site at Crimdon, near Hartlepool, with evidence suggesting dogs were let loose over the weekend. Durham Heritage Coast (DHC), which manages the site, described the incident as "heartbreaking". 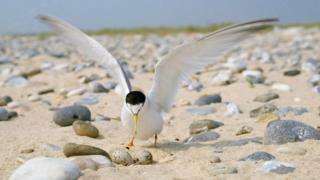 Little terns are among the UK's rarest sea birds and are protected by law. Police are investigating. The site, which is one of 20 in the UK, is protected by fences and is watched over by wardens during the day. A DHC spokeswoman said: "It is with great disappointment we report that Crimdon's little tern colony suffered a serious loss of 50 nests. "With the information we have, it would appear that someone deliberately entered the site with a dog or dogs and devastated virtually every nest. "As a Schedule 1 listed species due to its rarity, this has been very disheartening given all the time and effort put in by staff and volunteers as part of the Little Tern Recovery Project." The site has been targeted by vandals and egg thieves in the past. In June 2013, 50 eggs from 65 nesting pairs were taken. It is believed some eggs were also taken during the weekend incident, but the DHC said most were probably destroyed or eaten by dogs. The spokeswoman added: "This is really heartbreaking. We hope the the remaining nests will survive and those which have lost nests may try again. "The colony had a really bad year in 2015 and we were hopeful that this year would be a good one with all the nice weather we've had. "We'll be reviewing our security at the site, but we are limited by the funding we have." The birds, which arrive in the UK from Africa in April and May, need a mixture of sand and shingle to make their nests. This means they usually choose beach areas susceptible to attack from natural predators like kestrels and sparrow hawks.